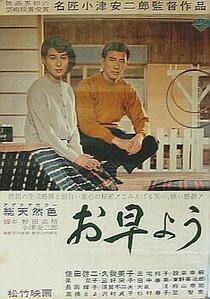 Good Morning is director Yasujiro Ozu’s 1959 comedy about a small suburban Japanese village and the people who live there, and while the movie maintains a lighthearted feel from start to finish, it nevertheless has something interesting to say about gossip, and how it can occasionally turn neighbor against neighbor. The story is modest, and concerns the attempts of two young brothers, Minoru (Koji Shigaragi) and Isamu (Masahiko Shimazu), to convince their father to buy a television set. When he refuses, even going so far as to chastise the boys for bringing the topic up, the brothers rebel and stop speaking altogether, both at home and in school. This leads to a misunderstanding when the two walk past their neighbor, Mrs. Haraguchi (Haruka Sugimura), and ignore her greetings. Believing their snub has something to do with a recent incident, in which she was accused of stealing money from a local club, Mrs. Haraguchi angrily kicks off a series of events that soon has the entire neighborhood up in arms. In Good Morning, Ozu successfully recreates the atmosphere of a typical suburban town, from the plethora of clotheslines permeating from every corner right down to the door-to-door salesmen, who never seem to take “no” for an answer. His penchant for meticulously framing shots is also quite prevalent in Good Morning, here used to relate its tale in as straightforward a manner as possible. And while some of the comedy is surprisingly low-brow (there are several fart jokes thrown into the mix), Ozu’s message of how simple miscommunication can create rifts within a community is delivered unscathed. Good Morning may be slight, and perhaps doesn’t translate well to a modern audience (In an age when most families own multiple television sets, its central story is dated, and so sparse it would barely fill a television sitcom). But the movie is crafted with enough warmth and understanding that it’ll undoubtedly bring a smile to your face.